Taylor Swift is known for confessional lyrics that slyly chronicle her romances with famous (and not so famous) men. But on occasion, Swift also speaks up when away from the mic. Here's a look at what we like to call Swift-ology. "I make sure I only write bad songs about the (guys) who deserve it." -- Glamour, 2010. 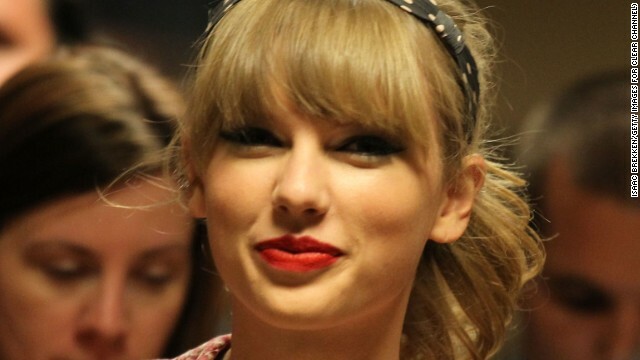 (CNN) -- Brava for having a sense of humor, Taylor Swift. The singer has released the video for her new song "Blank Space," in which she plays a crazy version of herself taking revenge on a boyfriend. The single is a clever take on Swift's reputation for working out her relationships with exes via song lyrics. Swift, Spotify ever getting back together? The video shows the star and her handsome beau falling in love. There are romantic dates as the pair romp within and around a palatial mansion. But then things go horribly wrong, and Swift begins destroying everything from his clothes to his sports car. And fans get to not only enjoy a different type of Swift, they can take the experience one step further with an app. The "Blank Space" app allows viewers to follow along with the music video, placing them in the room with Swift and her co-star for an interactive experience -- with some fun extras. According to Forbes, the app includes "other characters who don't actually appear in the official video." "The butler, the artist and the gardener all have their own storylines (small as they may be), and you can choose to walk around with them while listening to 'Blank Space,' " Forbes reported. "On top of that -- and perhaps more importantly -- are the Swift-related objects scattered throughout the set, just waiting to be found." Acclaimed music video director Joseph Kahn helmed "Blank Space" and told Rolling Stone it was meant to offer a "deconstructivist version of Taylor Swift." "She knows that there's this meme that if you date Taylor Swift, you're going to end up getting a song written about you," Kahn said. "She wanted to address that."